Since thereâ€™s been a theme of lawn chairs lately here on this camping blog, I thought it was time to really bring out the best lawn chairs have to offer. Itâ€™s a $600 chair, so itâ€™s more than an entire set of regular lawn chairs, but this ainâ€™t no ordinary lawn chair. First of all, just look at it. It looks like itâ€™d be at home as a stylish statement in a foyer, but no, this is an outdoor chair. 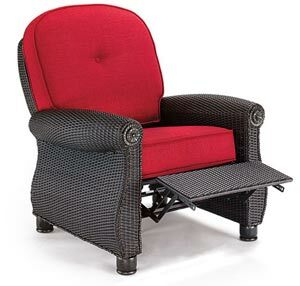 It has a rustproof aluminum frame and fast drying cushions. Oh yeah, and ainâ€™t she pretty. So next time you park your class a motor home at a campground, be sure to pull out a couple of these puppies so you can be the envy of the whole campground. And if you just canâ€™t justify $600 for a lawn chair, stick it in the foyer for the rest of the year and just throw it in the camper when you leave on your next trip.